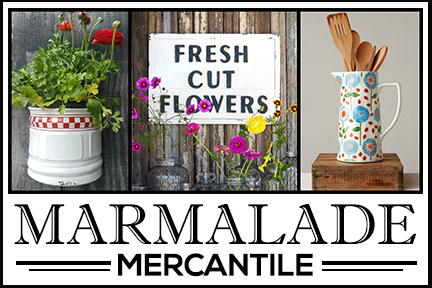 So happy to announce that we’ve got a special edition of Farmhouse Friday for you today! 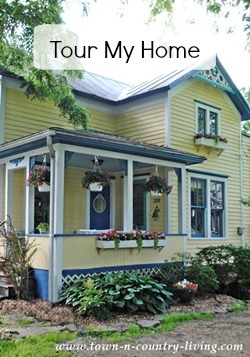 We’re featuring our spring home tours and we all have a little something special to share. For me, that something special is the color coral. 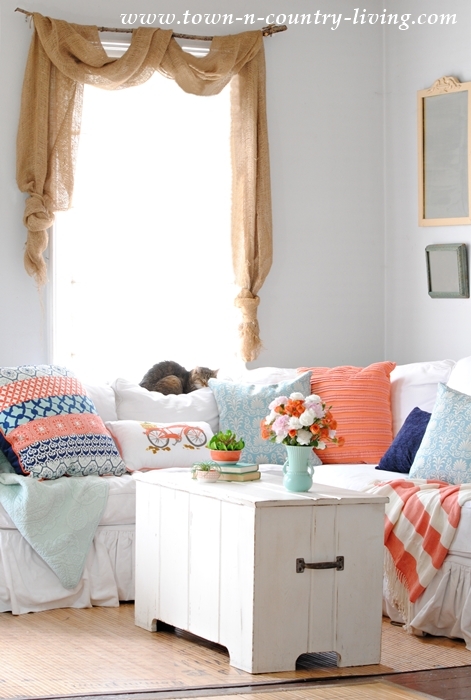 It’s not a color I normally choose, but I’ll explain how pops of coral came to occur in my humble home this season. 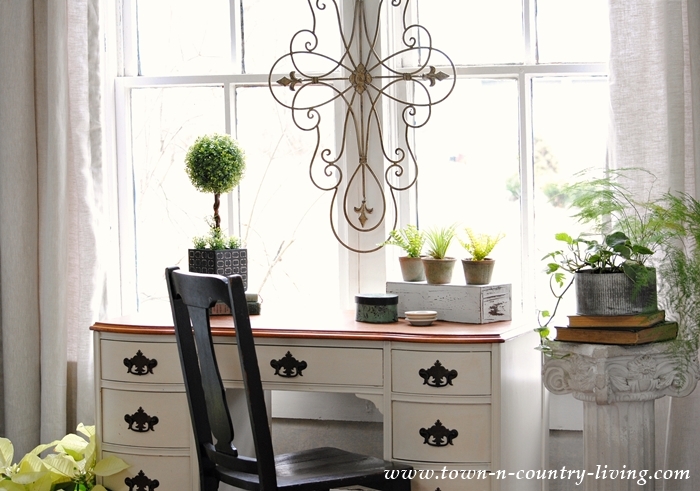 I’m also excited to say that Country Living Magazine is hosting our spring home tour! It’s been my favorite magazine ever since I first became a homeowner and I’m pleased as punch to work with them! 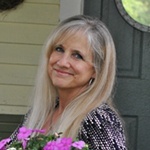 Be sure to visit the other bloggers listed at the end of this post. You won’t be disappointed! 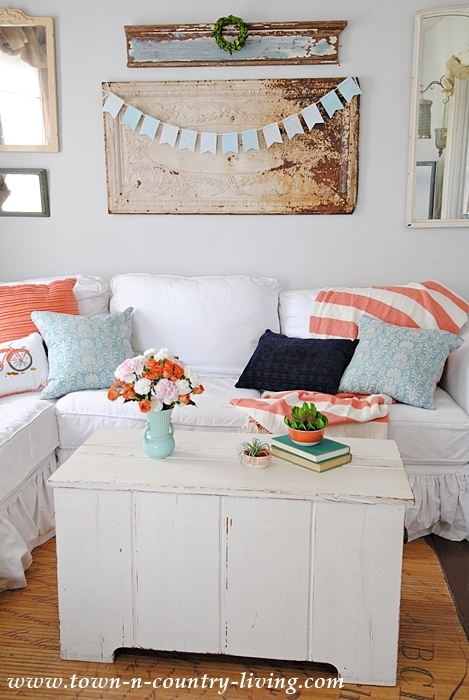 In the family room, it was easy to add pops of coral with a few new pillows. Taffy enjoys the new pillows while basking in the sun flowing through the window. This is her favorite spot. For my family room, it started with this pillow. I saw it on the shelf at Target and had to have it. 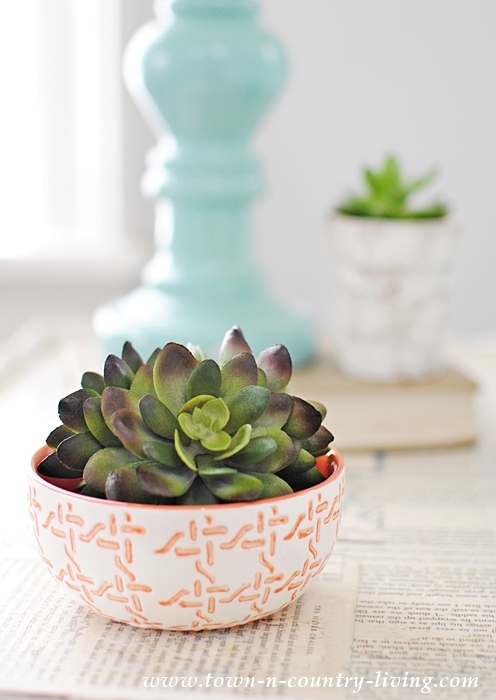 The colors reminded me of my new coral bedding that I paired with navy. And I had aqua pillows already, so this pillow choice was a no-brainer. I love putting colors together. When I was fresh out of college, I worked at a high-end clothing store and had to quickly learn to pair colors and patterns. I guess I must’ve gotten fairly good at it because the store manager put me in charge of doing all the store displays, including the window displays. 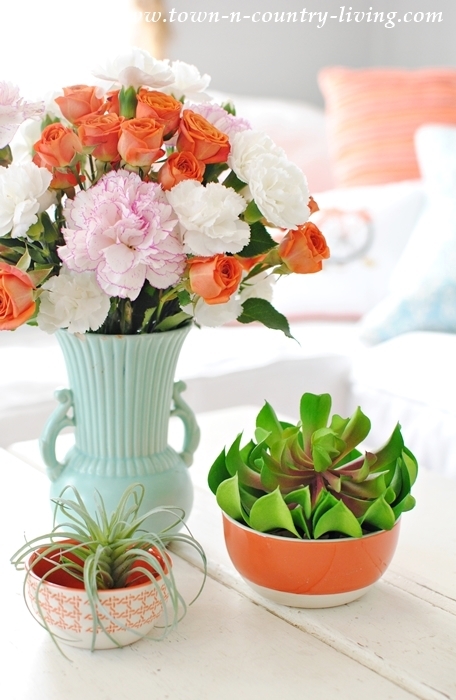 Hubby found coral-colored spray roses at the store, which look cottage-cute in my vintage aqua vase. 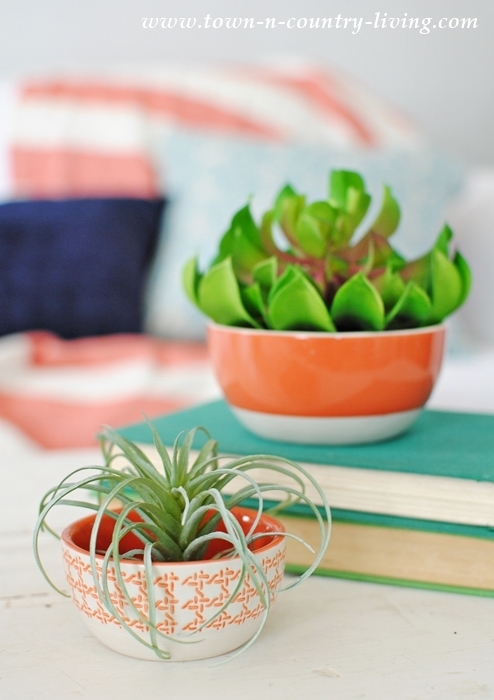 An air plant and a faux succulent get tucked inside coral-colored bowls. 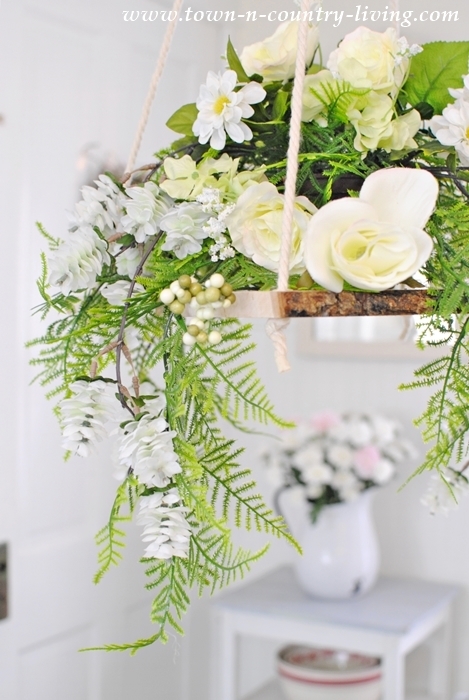 My rusty ceiling tin gets dressed with a simple banner, while a miniature boxwood wreath takes up residence on the architectural board above it. 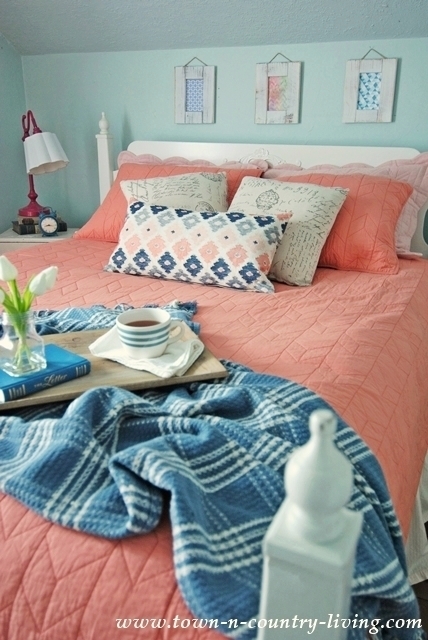 This room makes me happy with its accents of coral. 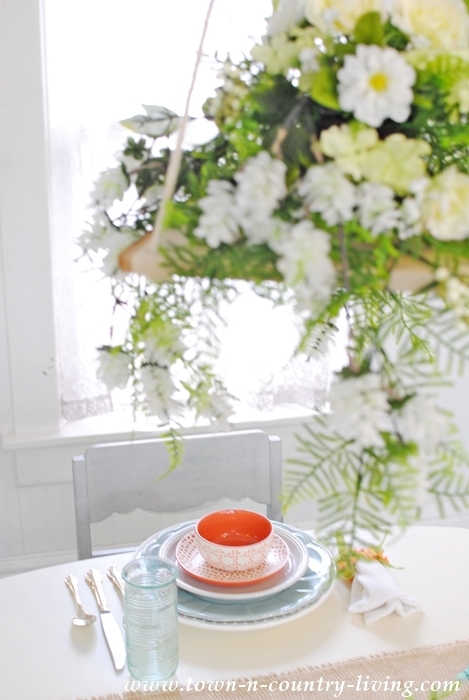 Coral makes its appearance in my kitchen dining nook, along with a little bit of aqua. 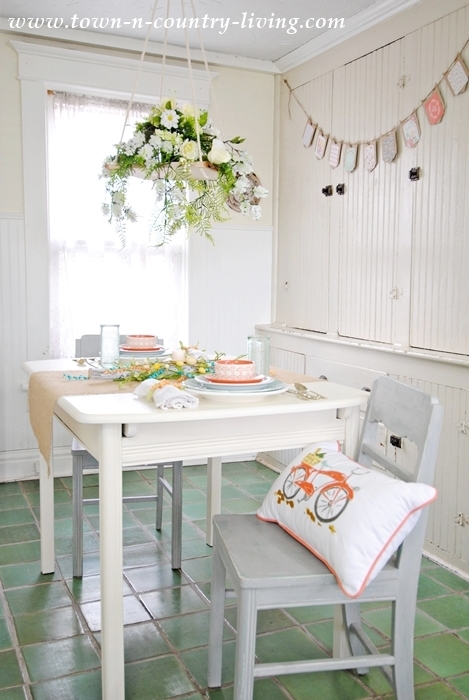 A fun bicycle pillow with coral piping adds softness to my Nordic dining chair. 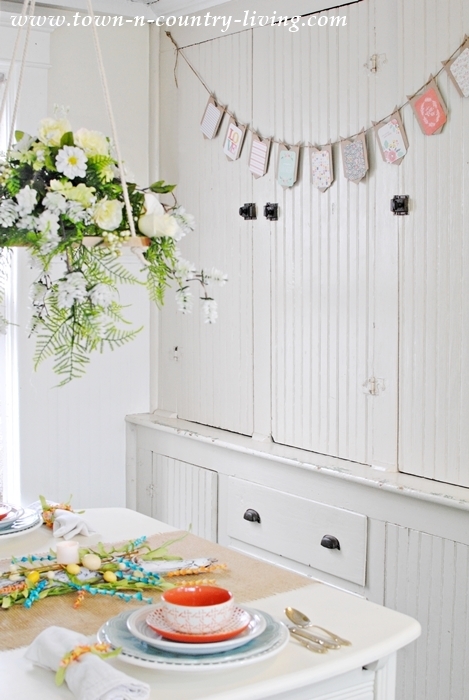 Earlier this week I shared how to make the simple spring banner that graces my built-in cupboard. Above the table I hung a floral chandelier that I made using a flat piece of birch wood and faux flowers. I saw flowery chandeliers like this at the Chicago Flower and Garden Show a couple weeks ago and decided to make one of my own. When my flower garden is in full bloom, I’ll make another one using fresh flowers from my yard. 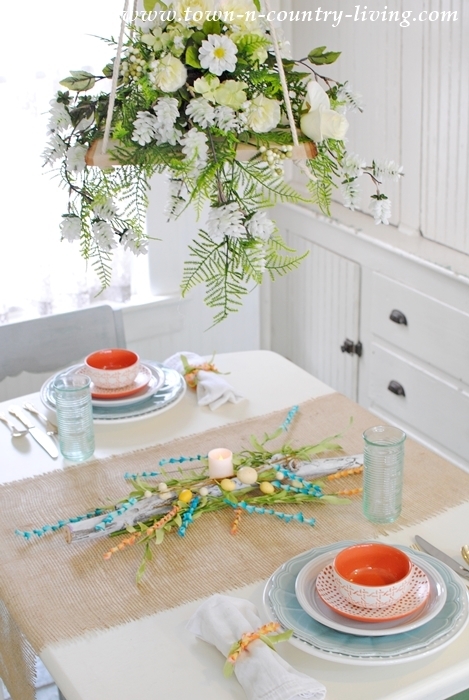 For the table setting, I layered white, aqua, and coral-patterned dishes. I like to layer plates even though we might not use them all in one sitting. It’s just like layering clothes … layers add more interest, style, and color to the outfit. For my spring centerpiece, I used a white-painted branch with a single votive in the center, and floral sprays tossed on top. 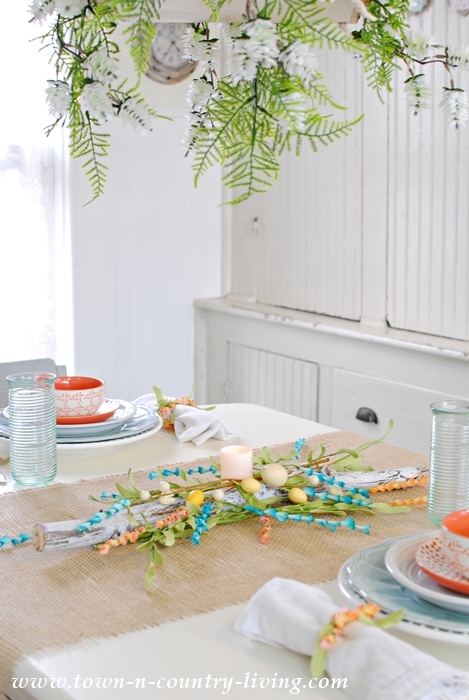 Sometimes a slightly messy centerpiece is a good thing. 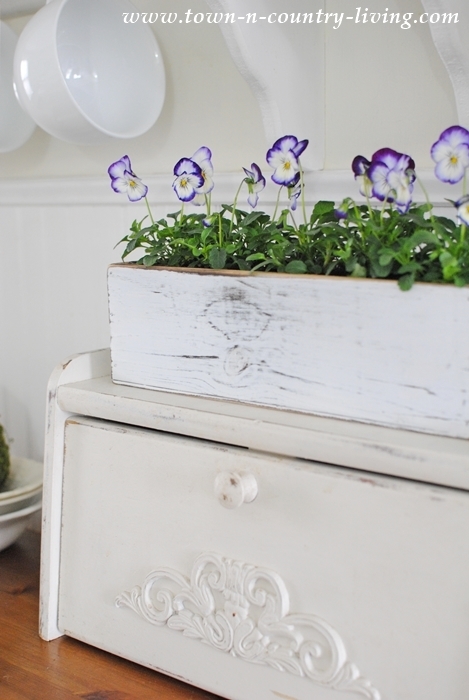 My kitchen sideboard sports a few cheerful violas. I love their happy little faces. I always have violas and pansies in the yard. These will soon be transplanted outside. I don’t know if I’ve shared my Milk and Cream sign before. 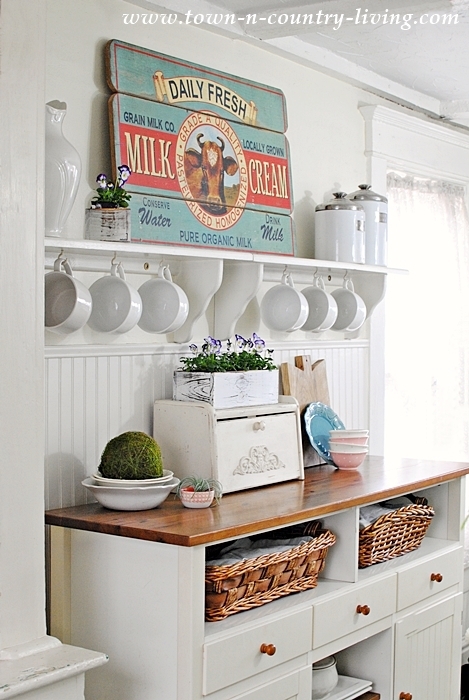 I think it’s perfect for Farmhouse Friday. 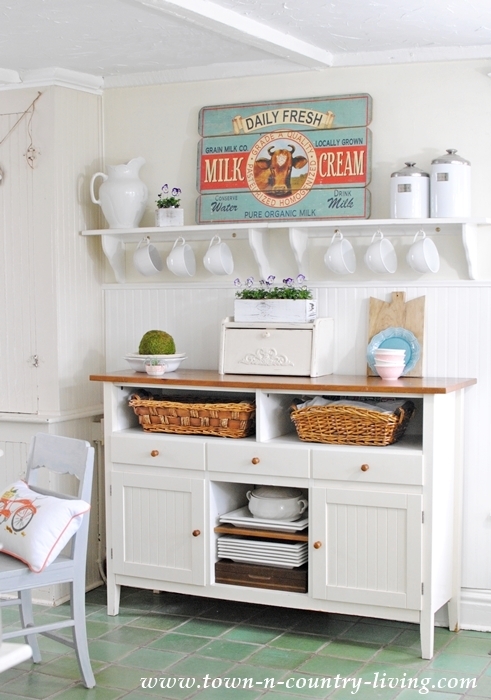 You know, when I first started blogging I was afraid to share pictures of my kitchen. It’s not modern. It’s not high-end. It doesn’t even have a dishwasher. I nervously pushed that “publish” button the first time I shared it. But it’s my favorite room in the house and I’ve learned to embrace its shortcomings. 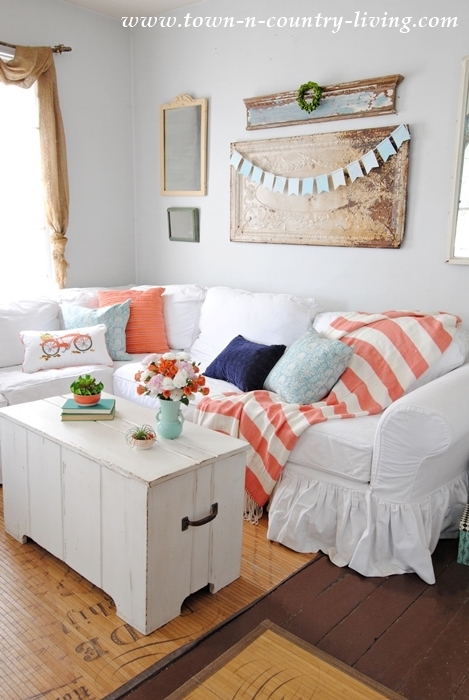 A few pops of coral can be found in my living room, too. 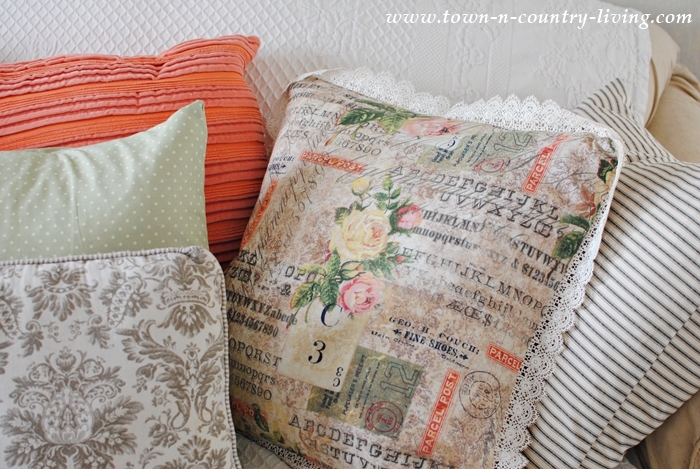 I fell in love with this vintage fabric and made pillows with it. 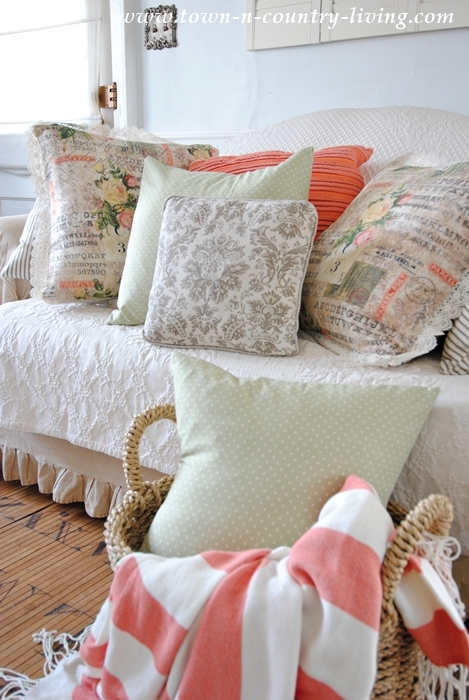 Just like the family room, it was easy to add a bit of spring freshness here in my living room just by swapping out the pillows. Nearby is my desk where I enjoy morning sun from the east streaming through the windows. New Belgian linen drapes from Barn and Willow frame the double window. I kept this area simple with a few touches of greenery. 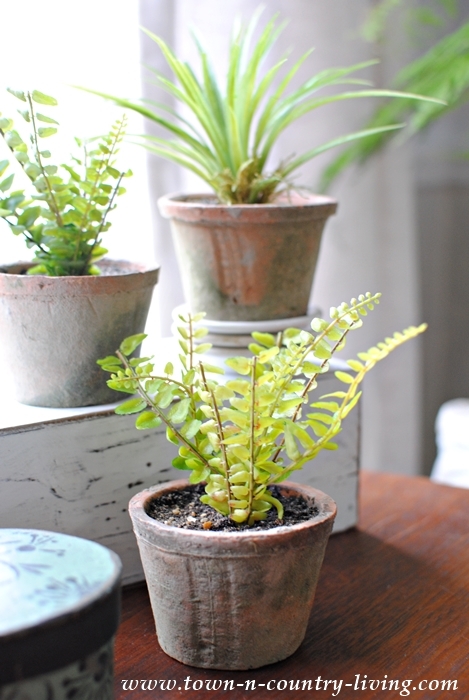 A few faux ferns in garden pots add softness. I’ve started combining live plants with faux plants. In the event that the real ones die, I’ve still got the fake ones to rely on. This is the room that started it all. I found the beautiful coral bedding at Crane and Canopy and it motivated me to add pops of coral throughout my home for spring. I feared I might tire of the color, but I’ve only fallen more in love with it. Coral looks great with both navy and aqua, among other colors. 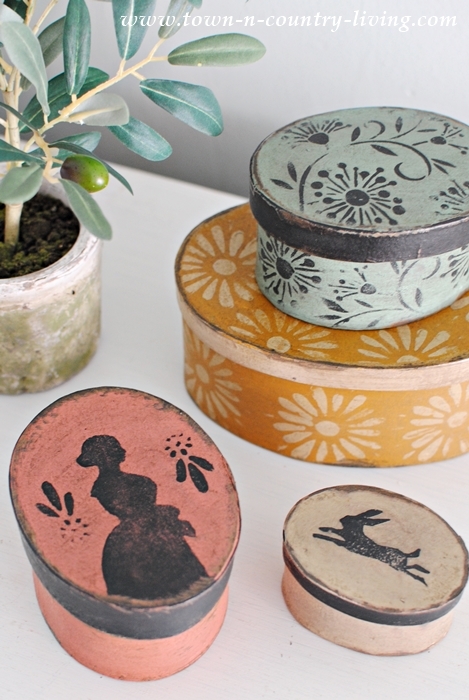 I recently found these darling country style paper mache boxes from Hanway Millhouse on Etsy. They’re on my dresser in the bedroom; the bunny is perfect for the spring season. This one was the first to catch my eye. It reminds me of a painting my grandmother had in her home. It’s more of a salmon color, but it’s close enough to coral! 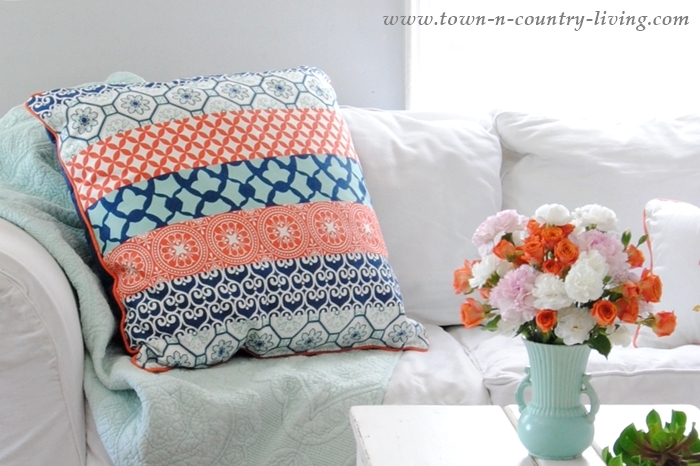 Hope you enjoyed my home tour celebrating spring with pops of coral! 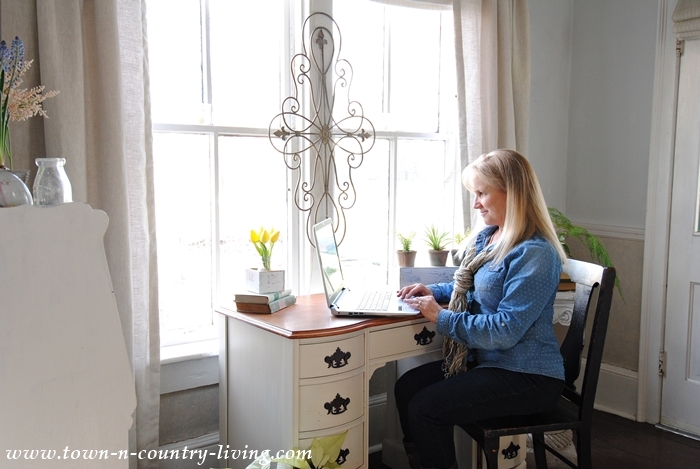 On Wednesday, I shared my spring dining room along with 6 decorating tips to bring the outdoors in. A very special thanks to Country Living Magazine who will be featuring our homes a little later today! So honored to partner with my favorite magazine of all time! 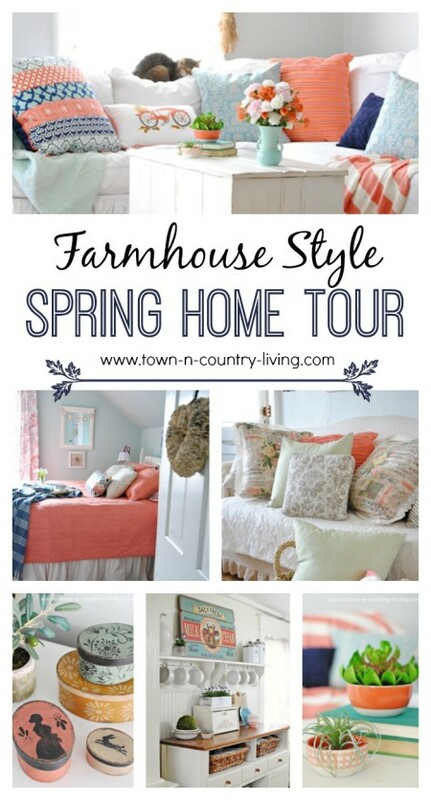 Now enjoy my fellow farmhouse bloggers home tours by visiting the links below. I am blown away by all the color!!! Love it! 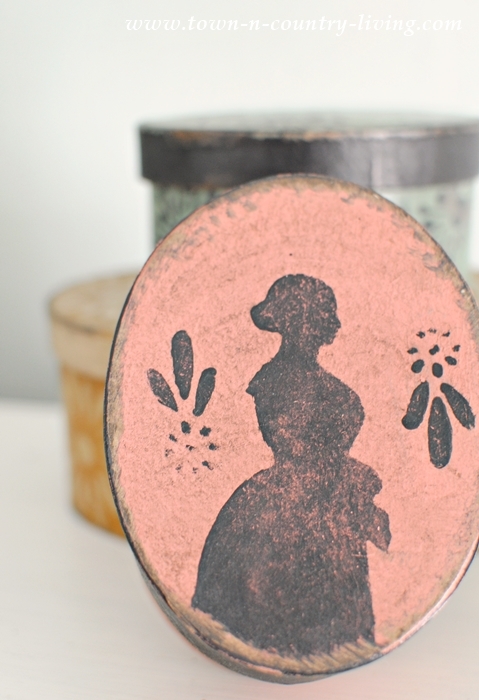 I adore all the coral all throughout the house. 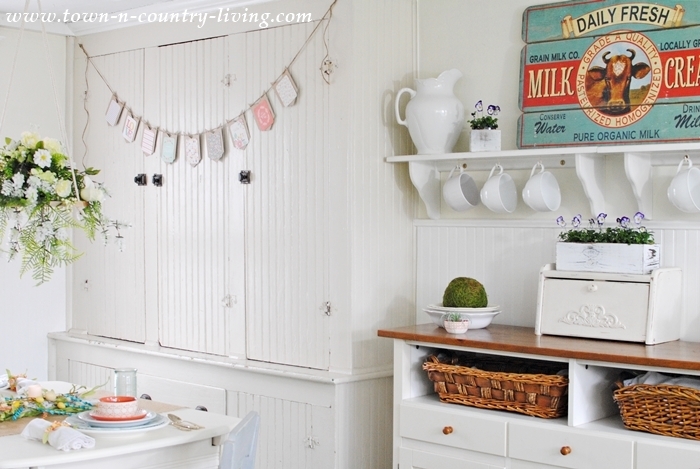 Vibrant, cozy, and refreshing! It all blends together so well; great Job! Love all the color, especially the coral. And that floral chandelier? LOVE! S0 many great ideas in this post. Your home always look so cheerful and inviting and I adore your pops of coral That fabulous coral Milk – Cream sign just might find it’s way to my house. LOVE IT. 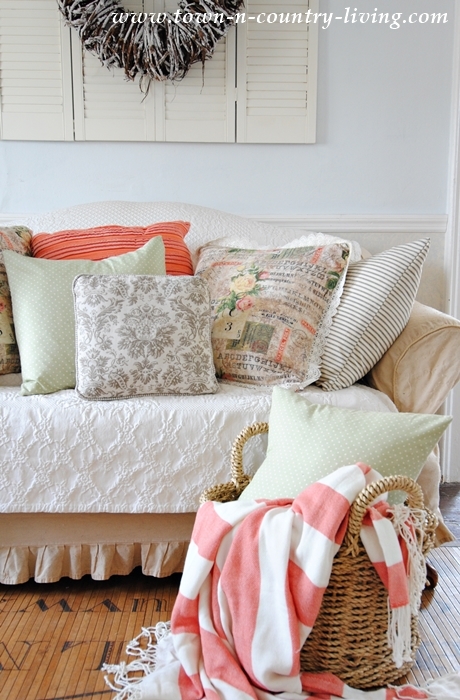 I love the coral and salmon hues in color and your home is totally gorgeous with these colors now! It looks beautiful. 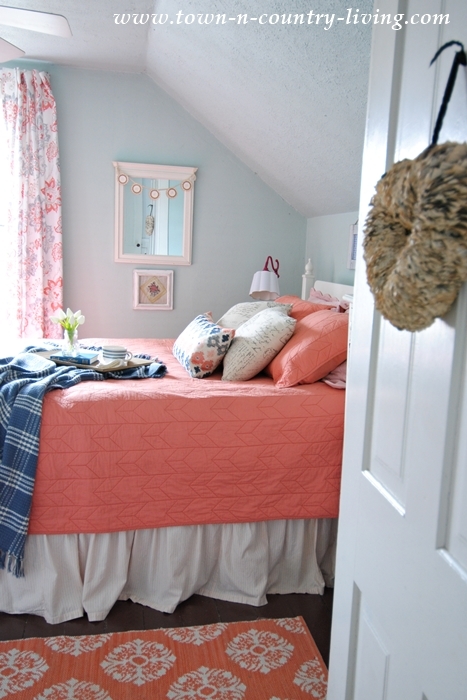 I was using coral and gray with a little touch of aqua in the master bedroom during the winter. Just recently changed the pillows out to something else for summer, but will go back to the coral combination in the fall. I never get tired of it.. It looks so pretty, I love all the color! 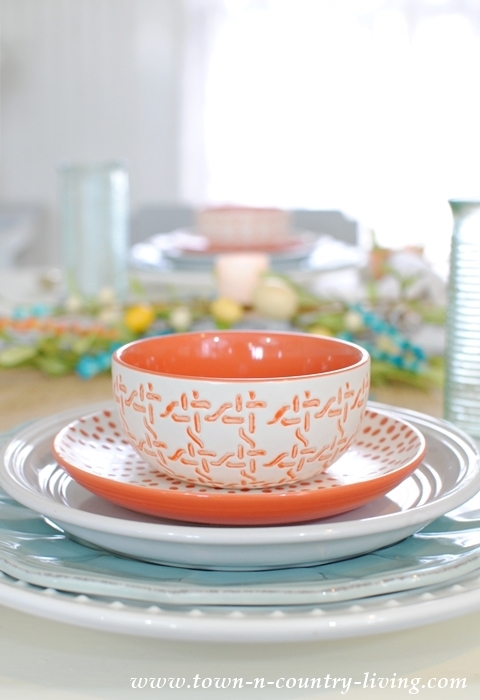 Love the cheerful coral and turquoise-gorg! So pretty. 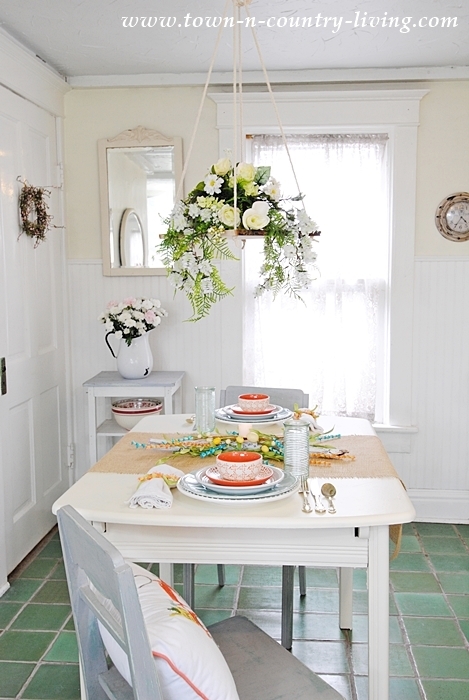 I love your table centerpiece and the vintage style fabric you made pillows from. 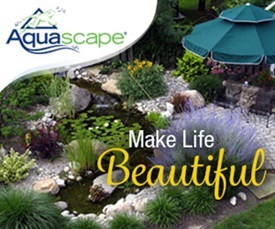 Your home is just gorgeous! Jennifer I love your house so much and your kitchen is my fav too! 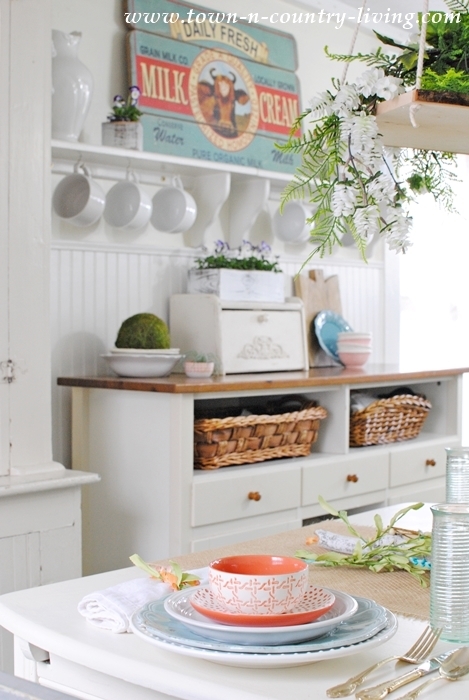 I wish my kitchen were half that pretty!